Macroeconomic issues, with particular reference to: a) economic growth and sustainable development; the theory and praxis of foreign trade; the theory and praxis of foreign direct investment; b) the globalization of the economy; c) labour market(s); d) financial market(s); e) exchange rates; f) technology transfer; g) development economics; h) European economic integration issues. Microeconomic issues related to small and medium-sized enterprises, including the process of their internationalization and their ability to create innovation, including eco-innovation. 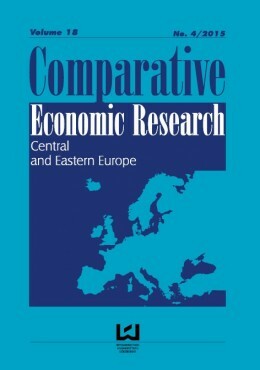 A comparative analysis of interdisciplinary issues in economics related to environmental protection, including selected aspects of mitigating climate change, the development of renewable energy sources in the context of EU energy policy, and the policies of international organizations in this field, as well as policies related to, among others, the development of sustainable transport, sustainable agriculture, and sustainable tourism. The Journal aims to co-operate with researchers from different countries. We would be happy to collaborate with young postdoctoral researchers and scholars, who are welcome to submit publications to our journal. 1) Zagadnień makroekonomicznych, ze szczególnym uwzględnieniem: a) wzrostu gospodarczego i zrównoważonego rozwoju; b) globalizacji gospodarki; c) rynku pracy; d) rynku finansowego; e) kursów walut; f) transferu technologii; g) ekonomii rozwoju; h) kwestii europejskiej integracji gospodarczej ze szczególnym uwzględnieniem jednolitego rynku europejskiego oraz polityki gospodarczej i społecznej UE, kwestii regulacyjnych i globalizacji. 2) Zagadnień mikroekonomicznych, związanych z małymi i średnimi przedsiębiorstwami oraz procesem ich internacjonalizacji i zdolności do tworzenia innowacji. Czasopismo afiliowane przy Wydziale Ekonomiczno-Socjologicznym Uniwersytetu Łódzkiego. W przypadku prac doktorantów wymagana jest opinia promotora wraz z rekomendacją. Nadsyłane artykuły powinny uwzględniać aspekty porównawcze. Opłata powinna zostać uiszczona w przeciągu 7 dni od otrzymania wiadomości e-mail potwierdzającej zgodę Recenzentów i Redaktora naczelnego Czasopisma na publikację tekstu. Recenzja tekstów prowadzona jest w formacie double blind review. Każdy artykuł sprawdzany jest przez przynajmniej dwóch recenzentów. Szczegółowe informacje uzyskają Państwo pod numerem telefonu: 42 635 51 62 lub przesyłając zapytanie na ww. adres e-mail. In the case of articles submitted by doctoral students we need their doctoral supervisor’s opinion along with a recommendation. Submitted articles should include comparative aspects. • USD 150 + VAT : foreign natural persons and companies. Publication fee shall be paid within 7 days of receiving the email from the editors with information about the qualification of the paper for publication (after the approval of the reviewers and the editor-in-chief). The review process is arranged by double blind system. Every text is subject to at least two reviews. For more information please call: +48 42 635 51 62 or send your questions to the above e-mail address. Zespół redakcyjny, w oparciu o Zasady COPE, może wycofać artykuł z publikacji, wyrazić wątpliwości dotyczące jego zawartości lub zadecydować o potrzebie wprowadzenia korekt do materiałów już opublikowanych. Nieopublikowane artykuły nie mogą być bez pisemnej zgody autorów wykorzystywane przez członków zespołu redakcyjnego ani żadne inne osoby uczestniczące w procedurach wydawniczych. Reporting standards: Authors reporting results of original research should present an accurate account of the work performed as well as an objective discussion of its significance. Underlying data should be represented accurately in the manuscript. A paper should contain sufficient detail and references to permit others to replicate the work. Fraudulent or knowingly inaccurate statements constitute unethical behavior and are unacceptable. Multiple, redundant or concurrent publication: An author should not in general publish manuscripts describing essentially the same research in more than one journal or primary publication. Parallel submission of the same manuscript to more than one journal constitutes unethical publishing behavior and is unacceptable. Acknowledgement of sources: Proper acknowledgment of the work of others must always be given. Authors should also cite publications that have been influential in determining the nature of the reported work. Authorship of a manuscript: Authorship should be limited to those who have made a significant contribution to the conception, design, execution, or interpretation of the reported study. All those who have made significant contributions should be listed as co-authors. Where there are others who have participated in certain substantive aspects of the research project, they should be named in an Acknowledgement section. Hazards and human or animal subjects: If the work involves chemicals, procedures or equipment that have any unusual hazards inherent in their use, the authors must clearly identify these in the manuscript. Disclosure and conflicts of interest: All authors should disclose in their manuscript any financial or other substantive conflict of interest that might be construed to influence the results or their interpretation in the manuscript. All sources of financial support for the project should be disclosed. Fundamental errors in published works: When an author discovers a significant error or inaccuracy in his/her own published work, it is the author’s obligation to promptly notify the journal’s editor or publisher and cooperate with them to either retract the paper or to publish an appropriate erratum. Accountability: The editor of a peer-reviewed journal is responsible for deciding which articles submitted to the journal should be published, and, moreover, is accountable for everything published in the journal. In making these decisions, the editor may be guided by the policies of the journal’s editorial board as well as by legal requirements regarding libel, copyright infringement and plagiarism. The editor may confer with other editors or reviewers when making publication decisions. The editor should maintain the integrity of the academic record, preclude business needs from compromising intellectual and ethical standards, and always be willing to publish corrections, clarifications, retractions and apologies when needed. Fairness: The editor should evaluate manuscripts for intellectual content without regard to race, gender, sexual orientation, religious belief, ethnic origin, citizenship, or political philosophy of the author(s). The editor will not disclose any information about a manuscript under consideration to anyone other than the author(s), reviewers and potential reviewers, and in some instances the editorial board members, as appropriate. Disclosure, conflicts of interest, and other issues: The editor will be guided by COPE’s Guidelines for Retracting Articles when considering retracting, issuing expressions of concern about, and issuing corrections pertaining to articles that have been published in International Studies: Interdisciplinary Political and Cultural Journal. Involvement and cooperation in investigations: Editors should guard the integrity of the published record by issuing corrections and retractions when needed and pursuing suspected or alleged research and publication misconduct. Editors should pursue reviewer and editorial misconduct. An editor should take reasonably responsive measures when ethical complaints have been presented concerning a submitted manuscript or published paper. Reviewers should identify relevant published work that has not been cited by the authors. Any statement that an observation, derivation, or argument had been previously reported should be accompanied by the relevant citation. A reviewer should also call to the editor’s attention any substantial similarity or overlap between the manuscript under consideration and any other published data of which they have personal knowledge.